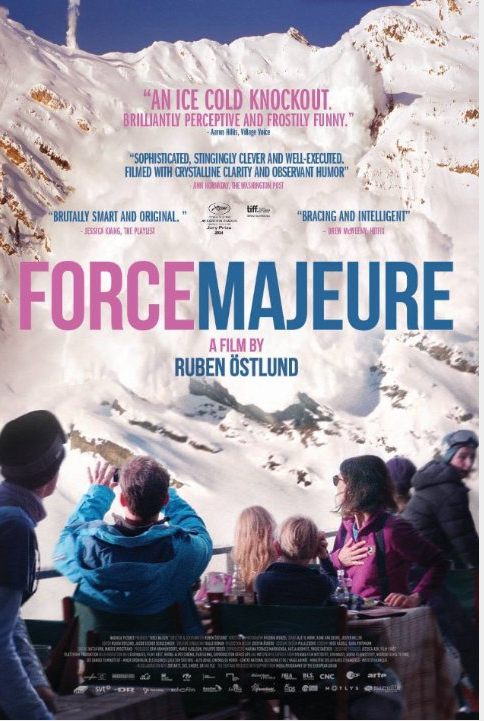 Force Majeure- rm– This is Swedish film with English subtitles and some English dialogue. Since it is quite clever and subtle, much of the credit should go to the Director and writer Ruben Ostlund. A couple and their two children go for a ski holiday at a French resort. They are suddenly faced with what seems to be a terrifying avalanche and how they act in a split second occupies much of this film. The film stars included Johannes Kchnke, Clara Wettegren and Kristofer Hivju. What emerges from this seven day holiday is an examination of relationships as well as the question of how comfortable are we with our self image especially when it is reflected back to us by someone we care about. The frank portrayal between the husband and the wife, another forty something man and his 20 year old girl friend as well as still another married women at the resort with a boyfriend all are viewed through a lens that is perhaps more Swedish then contemporary USA, if one can generalize. When the characters are in conflict they tell us or show us what they are feeling as well as the horns of their dilemmas. Several of the scenes, especially those with tension, seem to be drawn several beats longer that we thought were necessary. This seemed to lead us to be intellectualizing the action rather than feeling it. In any case we felt we were in the hands of a skilled filmmaker who kept us thinking about the characters and empathizing with their pain. There also was much to talk about after the credits rolled which is always the sign of a stimulating film (2014).